Winter Park Address for Less! Quaint, comfortable and ready to move in 1 bedroom, 1 bath condo on 1st floor. The unit has carpet and porcelain tile throughout, an updated kitchen with and eat-in kitchen space, plus a spacious living room and small screened-in porch overlooking a garden walkway. Current owner has replaced the water heater, garbage disposal, toilet and tub/shower valve. Master bedroom has a large window facing the front and a large walk-in closet. 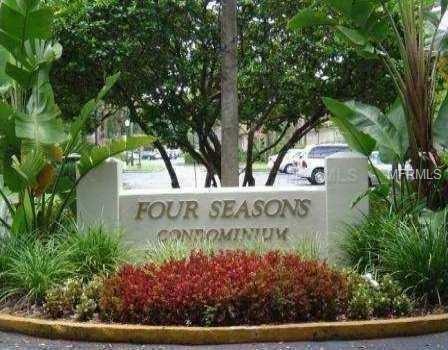 FOUR SEASONS CONDO COMMUNITY is in the center of it all, shopping centers, restaurants, hospital, Cady Way Park & Trail and just a 5 mins. drive from Downtown Park Ave., Rollins College and 15-20 mins. from the Orlando International Airport. Community has 3 pools, tennis courts, is surrounded by beautiful mature landscaping, with a maintenance free lifestyle and low HOA fees.